Updated 10.19.2018 For as long as I can remember, I’ve been fascinated with cruising to the edge of the Arctic ice pack. Several years ago, Alan and I almost made it during a cruise to Norway and beyond. But 30 minutes away from the ice pack’s edge, our cruise ship had to turn around for a medical emergency that would save a passenger’s life. Fast-forward to an Arctic cruise on a Silversea expedition where the itinerary includes one full day to prowl the edges of the Arctic ice. It’s a thrill to be checking this boomer adventure off my bucket list. But I’m looking for more than ice, there’s the possibility to see polar bears and other Arctic wildlife. Arctic Ice and water for as far as you can see. Walking out onto Silver Explorer’s bow, I’m surrounded by gray. The water’s a dull gray with the sky colored a slightly lighter shade of gray, accented by the white chunks of ice that I’ve come so far to see. 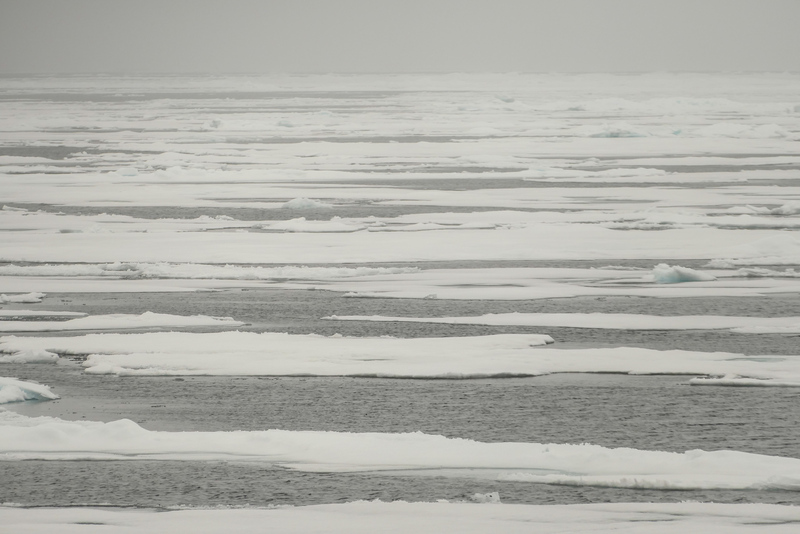 The Arctic scenery looks like a modernist painting or a gray and white puzzle that needs to be put back together. As the ship travels north, flat patches of ice become wider, with less gray water in between. Occasionally, a smaller piece glows a glacial blue from the ice that’s underneath the water. Turning my gaze away from the white ice and back toward the ship’s decks, a sea of red parkas stands out against Silver Explorer’s white exterior. 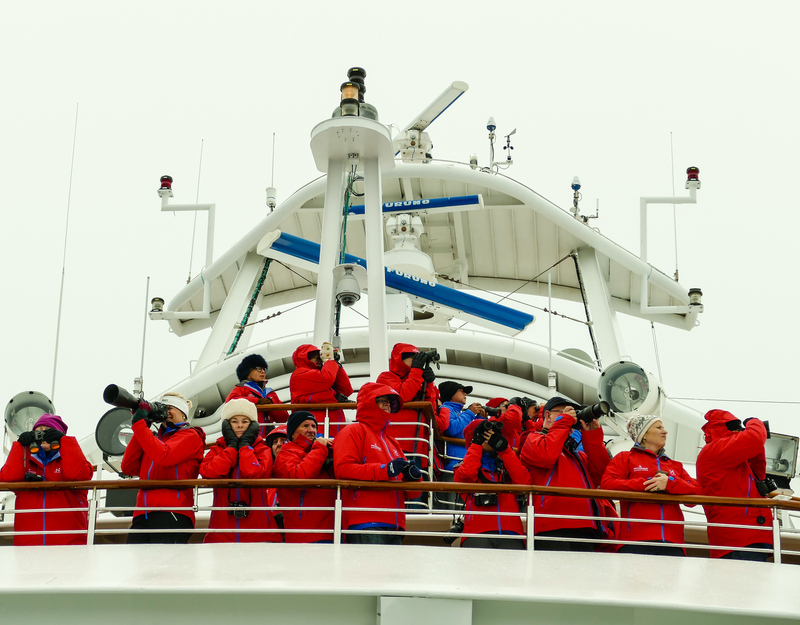 Most of the ship’s guests have donned their red Silversea jackets to watch this journey to the Arctic ice. Gazing through binoculars, cameras draped around necks, they’re on the lookout for that special blur of white—polar bears. When Captain Alexander Golubev spots a lone bear, expedition staff move among the guests showing us which direction to look. No outside announcements are made when wildlife is present. Squinting my eyes, I see him or her, striding along a sheet of Arctic ice. 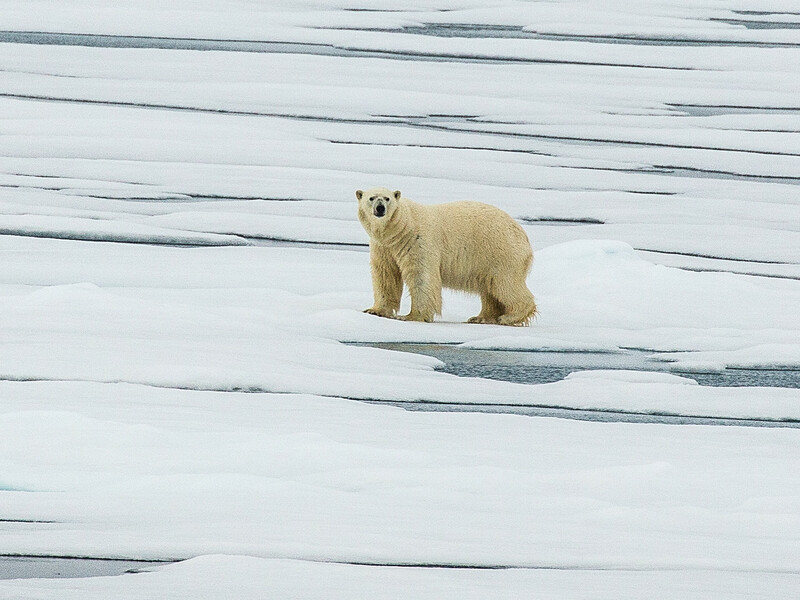 A polar bear as seen through Alan’s long camera lens. Silver Explorer lingers along the ice edge, motoring in the direction that the bear is moving. I zoom my camera lens as far out as it will go. The pictures probably won’t be that good but the camera also acts as my binoculars—there are only so many pieces of equipment I can safely hang around my neck. Hopefully Alan’s big lens will capture the photo that we want. However he’s hand holding that big lens because ships aren’t the best place for using a tripod, especially on a very crowded deck. Eventually, I let the camera drop, accept a cup of hot chocolate that the staff is handing out and simply enjoy the experience. Breathing in a big gulp of cold air, I marvel that I’m at the edge of the Arctic ice cap on a ship that’s stalking a polar bear. There’s a quiet reverence among the Silver Explorer guests as we watch the bear, whispering among ourselves, if anything at all needs to be said. The bear marches along, sits for a moment, before getting up to stroll the ice again. Even from a distance, his huge size is impressive. And the sight will have to be enough as this is only one of three polar bears that we see cruising the Arctic on Silver Explorer. But the Arctic ice fun isn’t over. Late in the day, Captain Gloubev finds an ice flow safe enough to allow guests to explore. After gearing up, we travel in zodiacs to the ice for our small group’s allotted 20 minutes. Alan photographs the Taiwanese contingent of cruise guests. 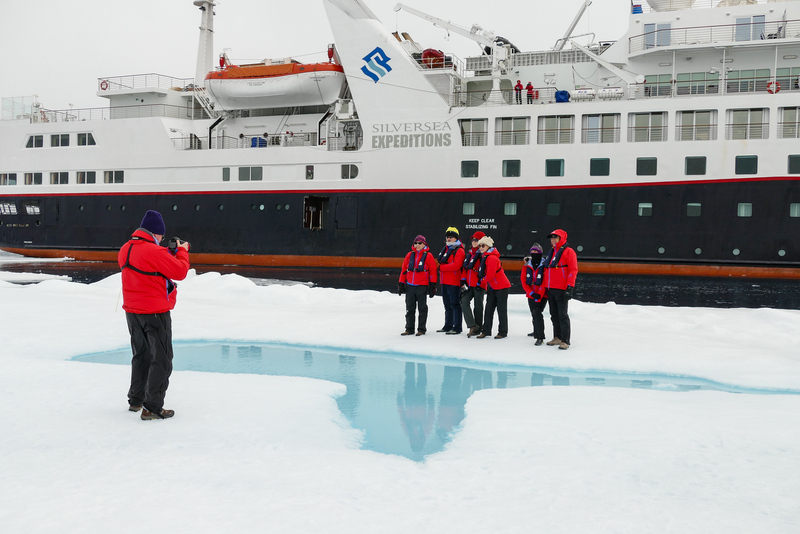 Reverence turns to a party atmosphere as guests pose on the ice in front of the ship. We snap photo after photo in the softening afternoon light before exploring the ice floe, following red flags that delineate the safe zone. It’s one of those boomer travel adventures where I can’t stop smiling. I made it to the Arctic ice. And unlike explorers before me who traveled in cramped boats, feeling every inch of the journey as the cold settled into their bones, I arrive in Silversea-style, my favorite combination of luxury and adventure. A late afternoon view of the Arctic ice. Alan walks over, puts his arm around me, and we silently watch a cold looking sun reflected in the blue water of a glacial pond. We’re making memories on a sheet of ice in the Arctic. Curious about this adventure? 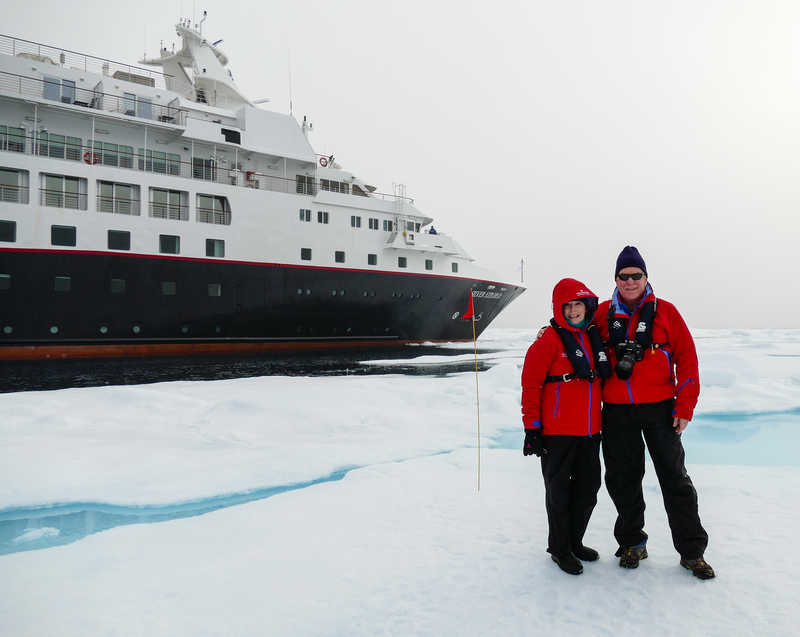 Read more about our Arctic cruise on Silversea. 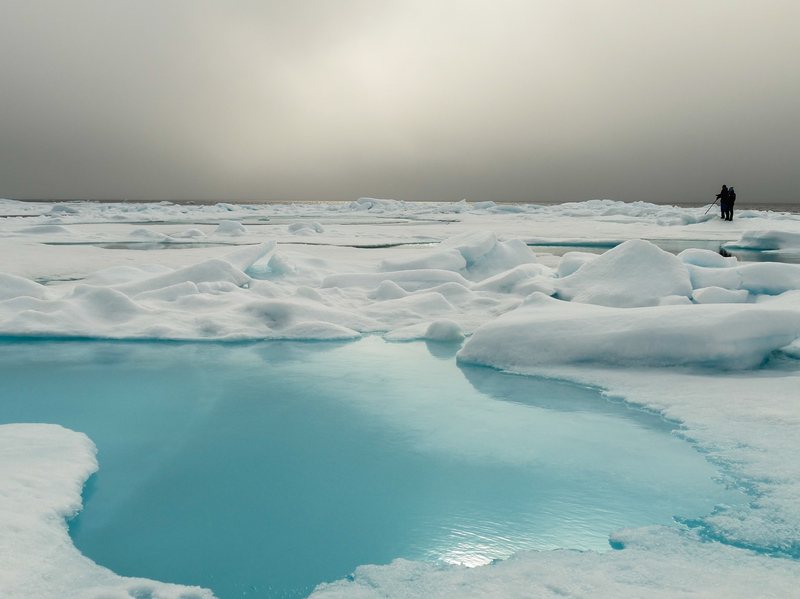 Have you cruised the Arctic ice? Join the conversation at the My Itchy Travel Feet page on Facebook or send us an email to ask a question or share your experience.